When making the decision of buying Dolphin Dance (named Johanne then) three years ago, I tried to gather all the information I could find on HR29. I had never sailed the boat, but just visited a couple of them in the harbour. Unfortunately, there was very little information to be found on the magazines. 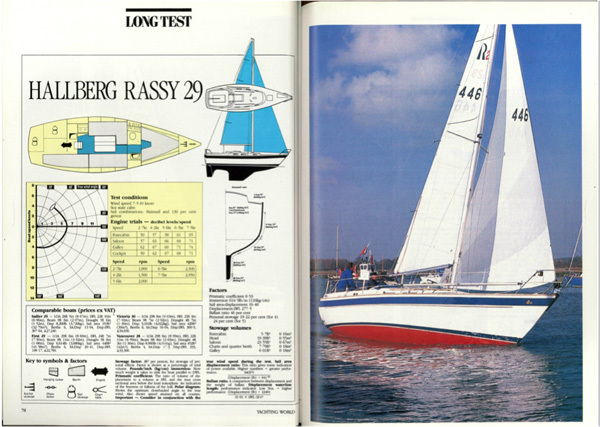 For example none of the Finnish boating magazines had tested this boat. The only article I came across was a short one page article by Yachting Monthly (11/1996). 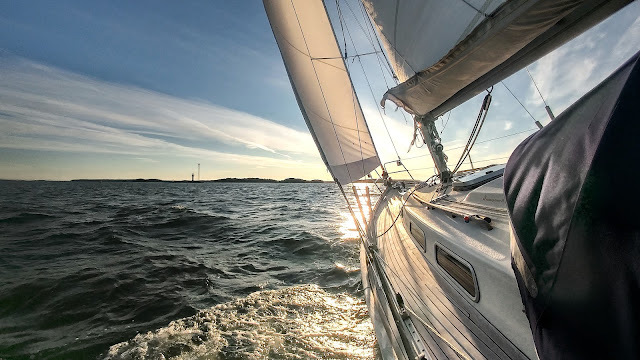 "Christoph Rassy and Olle Enderlein appeared guilty of some convoluted thinking; why else would they marry a modern fractional sailplan to a hull which looked tailor-made for a conservative masthead rig? Obviously, with 600 boats built up until 1993, they got the balance right between seakeeping and speed, proving that it's not just flat-bottomed cruiser-racers which can enjoy the benefits of a bendy spar." 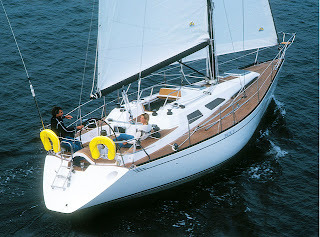 At the time of the design, the 7/8 fractional rig was a modern choice especially for a pure cruising boat. However, today the term 'performance rig' sounds bit of an overstatement, because the sturdy spar in HR29 has equal diameter from root to top whereas modern spars often taper towards the top. This makes them easier to bend. But I very much like the simplicity of the fractional sailplan, and find it more practical than the traditional masthead rig. Newly, I discovered that more older articles had been added to the Yachting & Boat World archive. 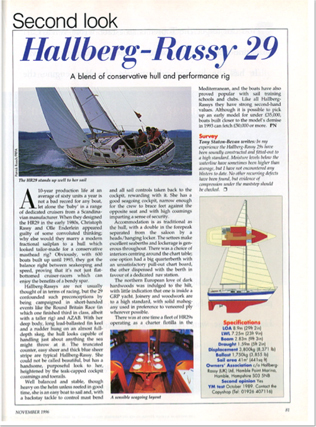 Thus, Yachting World's and Yachting Monthly's old HR29 test articles from 1989 are now also available for download. I decided to buy the YW's five page 'Long test' article, because it would be interesting to read what testers have written about the boat, and compare this to my own experiences. "Just because a boat is destined for a cruising lifestyle doesn't mean that it shouldn't be interesting to sail. HR29 certainly keeps the helmsman interested and offers a perceptible response to correct sail trim. " "Generous sail area offers good light weather performance"
"To cruise comfortably under sail is the raison d'être of the HR29. She panders to no racing rule and, while taking note of modern design trends, is sensibly traditional in almost every way." Access to engine and quiet installation scored high marks in the test and it is easy to agree with that. However, it is a bit surprising that the boat is said to be "extremely handy" under power. I have found that maneuvering astern in tight quarters is...well, not very handy, especially when compared with modern boats with shorter fin keel and spade rudder. In the article, there are some complaints regarding for example single-clipped hoses, exposed wiring runs attached to bulkheads, the lack of leecloths for the saloon berths and the lack of masthead tricolor light. However, all of these are quite easily fixed afterwards. If you have an HR29 or you are otherwise interested in this boat, it might be a good idea to check those articles. They can be downloaded from Yachting & Boating World archive. Feel free to leave a comment if you have experience or questions on this boat! And as always, you can also e-mail us at sydolphindance(a)gmail.com. Hi Pete, thanks very much for sharing your interesting story about the HR 26. It must have been quite an experience with a small boat in the Biscay! Fortunately, the boat was up to the task.